Looking for an all natural and economical sugar-free sweetener that actually tastes good? You need to try my natural sweetener blend! I’ve found that by using a combination of xylitol, erythritol, and stevia I can save money while enjoying a low carb sweetener that tastes just like sugar. When I started the Trim Healthy Mama diet I was leery about all the recipes using stevia because I have never liked it. All of the grocery store varieties and even the flavored liquid drops have a bitter aftertaste to me. In the past when I stopped using sugar on the South Beach Diet I used artificial sweeteners to replace it. Over the years I’ve read more about the negative effects of artificial sweeteners and I knew I needed to give stevia another try. I heard that the Trim Healthy Mama Gentle Sweet natural sweetener, which is a blend of xylitol, erythritol, and stevia, was a game changer so I thought I would give it a try. It really changed my perception of stevia. It had no aftertaste or bitterness. Because we have a strict food budget I became determined to come up with my own blend of erythritol, xylitol, and stevia. I try to save as many pennies as I can when I shop. Making my own sweeteners, baking mixes, seasonings, and cooking from scratch saves the most. 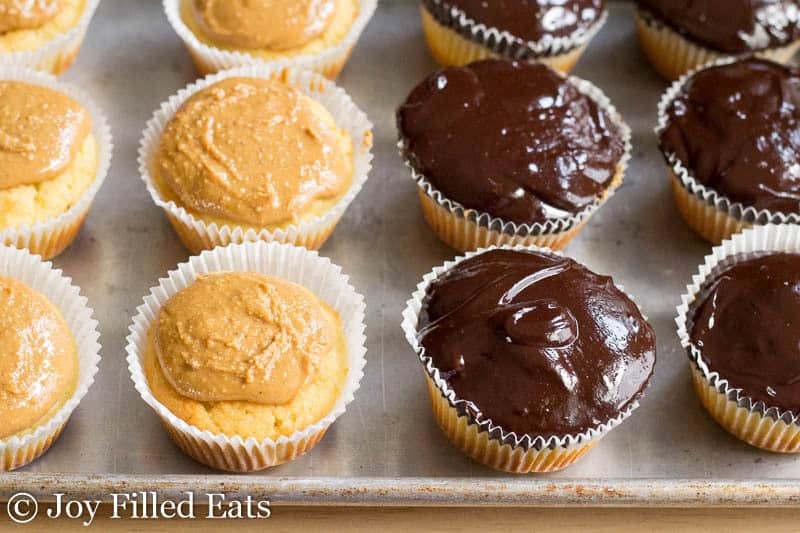 These Tagalong Cupcakes are one use for my sweetener. Don’t they look yummy? They are sugar-free! But you would never know. Even my husband who isn’t a dessert guy loved them. You can now mix up your own sweetener that measures just like Gentle Sweet. If you are on a tight budget this helps with this way of eating immensely. I use this sweetener in all my dessert recipes and I’ve subbed in it recipes from the Trim Healthy Mama Cookbook like the Trimtastic Cake. 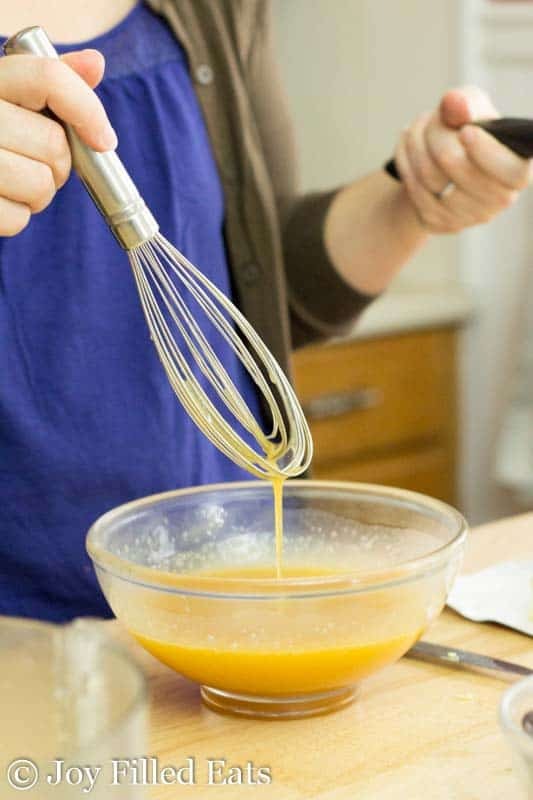 You can make everything from Sweetened Condensed Milk to Caramel with this recipe and more. 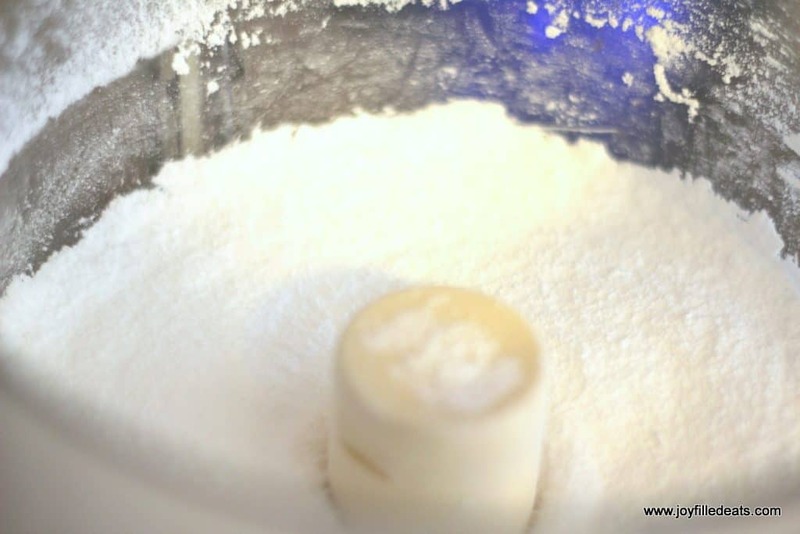 If you grind this in a food processor it works great as a low carb powdered sugar. It is the best out of the low carb and keto sweeteners! Xylitol is a natural sweetener. It is a sugar alcohol made from birch trees or corncobs. It has 40% fewer calories than sugar and is a 7 on the glycemic index (white sugar is a 64). Please note that xylitol can be fatal to dogs so don’t share treats containing xylitol with your furry friends. Erythritol is a sugar alcohol like xylitol. It occurs naturally in some fruits and vegetables It has zero calories and no impact on blood sugar. It is it is produced from glucose by fermentation with yeast. Stevia is a plant discovered in South America. To make stevia powder a water extraction method is typically used. Stevia is 100 to 200 times sweeter than sugar so a little goes a long way. My natural sweetener recipe is easy and economical. There are many choices on where to order the ingredients from. And I’ve used several brands of these products successfully. I personally order the ingredients for this natural sweetener from amazon, thrive market, and iherb. 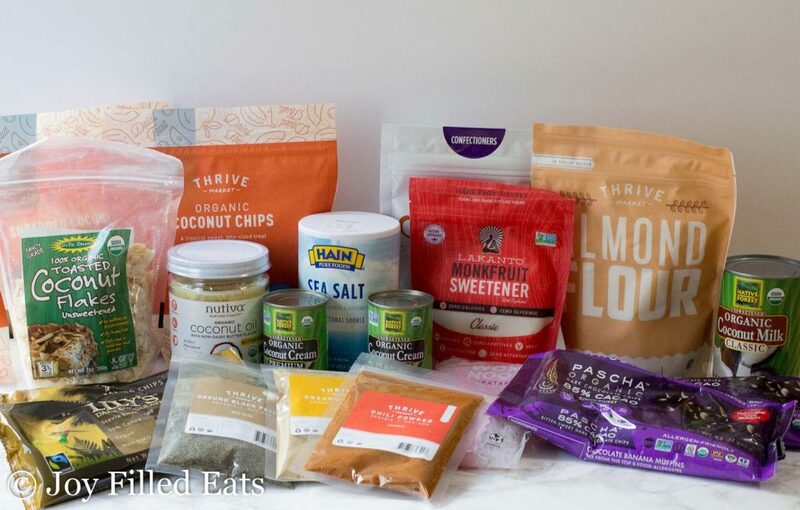 Thrive Market: My Thrive Market Coupon link works on everything from sweeteners and baking supplies to vitamins and beauty products! Thrive has great prices on coconut products, spices, organic health items, baby food, and more. Head over to this post to see the latest deals at Thrive. My favorite deal is always getting Lily’s Chocolate Chips for $3.95 a bag! iherb: If you are ordering from iherb for the first time you can get the ingredients to make 5 pounds of sweetener for under $40. Free shipping is on orders over $20. I ordered the ingredients from iherb.com with free shipping. They have a lot of products that work for THM. Other products they have that are compatible with THM are oat fiber, psyllium husks, whey protein powder, coconut flour, almond flour, etc. etc. This link takes you right to the 1necessary ingredients to start making your own sugar free sweetener! It’s cheaper to buy the 2.5 pounds but they also have 1 pound bags if you’d like to go small before you commit to a huge bag. It is very very easy. Click here for a longer list of THM friendly products sold on iherb. And here are a few more! They have so many I needed two links. With free one day and two day, Prime shipping Amazon is where I order from most often. I can consistently get xylitol and erythritol for about $5 a lb when buying 5 lb bags. I buy the largest size stevia and it lasts me about 2 years. And I bake A LOT. I have tried all of these brands and just buy whichever is the cheapest on the day I order! No big deal. Looking for an all natural and economical sugar-free sweetener that actually tastes good? You need to try my natural sweetener blend! Process in the food processor for a few minutes if you are planning on using it in skinny chocolate, beverages, or icing. For baking, you can just mix it together by hand. I've only been blending it when needed right before using it in recipes. I put a huge mason jar on my kitchen scale and just pour in the weight amounts of xylitol and erythritol and measure in the stevia. Then I shake it really well. Hi! Thank you for this recipe? Do you happen to know the mixture amounts if you want to blend xylitol with Pyure (already blended stevia and erythritol). I had gastric bypass 6 years ago & am super sensitive to sugar alcohols. Could I just double the amount of Stevia instead of using the Xylitol? I have not tested that. I know you can use all erythritol if you are less sensitive to that. The problem with using more stevia is that the sweetener loses a lot of its bulk and won't work in candies, icings, and some baked goods. Thanks Taryn! I used this in your Chocolate covered Caramel cups. YUMMY! I was curious about how each sweetener actually tasted plus wanted control of my sweeteners (control freak) and to save $$. I believe I will switch to this instead of all those store bought blends that more expensive. Good-bye Splenda too. This is twice as sweet as sugar. How much sugar were you putting in your coffee? If you were putting a regular spoonful (about 2 tsp) it makes sense you still need 1 tsp. If you want a sweeter blend you can add more of the organic stevia. You need a pure stevia powder. Are there other ingredients in your raw stevia? I'm a little confused about the nutritional information. At the recipe you said 1tablespoon is one calorie, However, in one of your replys in the comments (on Nov 2, 2018) you said you have it set for one teaspoon. Also, what do you mean by 'I manually subtract the sugar alcohol.'? Thank you so much! Erythritol has 0 carbs because you subtract the sugar alcohol (listed here as erythritol). Hi, I have read through all of the comments to hopefully avoid asking the same question but still want to clarify. For replacing sugar or erythritol, using this mixture, you decrease the amount by half but if using in place of Gentle Sweet then it is a straight swap? Do you have a conversion chart for sweeteners on Joy Filled Eats? It would be nice to have a point of reference so I don’t have to come back and read the comments again in the future if I get confused in a recipe. Thanks so much. I appreciate all the work people like you do and that you are willing to share to help others, like myself, save money and headache when cooking. "For replacing sugar or erythritol, using this mixture, you decrease the amount by half but if using in place of Gentle Sweet then it is a straight swap?" Yes and yes. 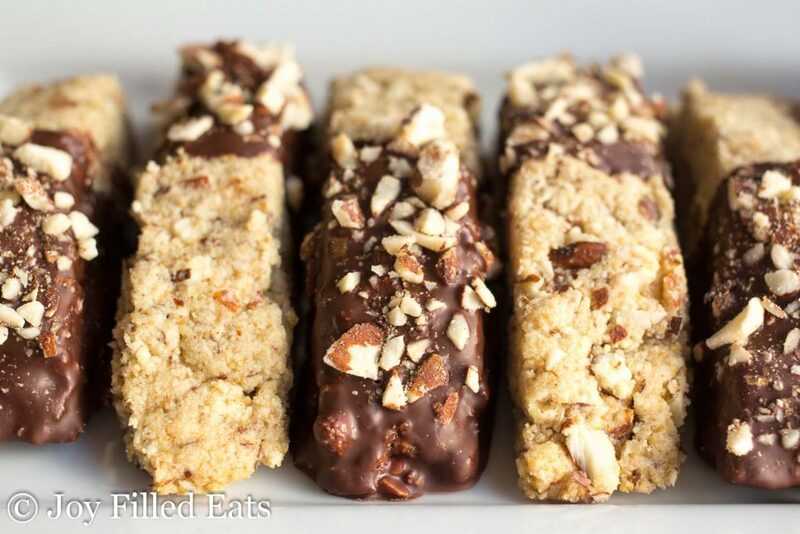 I don't have a conversion chart but do put notes in my dessert recipes with tips on converting. I have had readers use thm stevia. I've heard it's a little sweetener than the now stevia so just use a pinch or two less. If you mean a monk fruit blend like lakanto you could because both that and xylitol are 1:1 for sugar. Or you can just use all erythritol. Hi Taryn, can I make GS using lakanto monkfruit sweetener and xylitol since I don’t have Erythritol and the lakanto sweetener already has it added in and if so how much xylitol to a cup of the lakanto sweetener? Thanks you! I think that will work. It would be the same amount of lakanto to my amount of erythritol since they are both 1:1 for sugar. I am confused with the different brands of sweeteners. I have been trying several and not happy with any really. So a blend might help. I haven't bought erythritol or xylitol. Do these come under another brands? Does Swerve work for your amount of erythritol? I have a bag of stevia in the raw. Will this work for your amount of stevia? Also I bought monkfruit powder pure. It is so dense and strong that it doesn't work so can I mix these or should I just toss them? There is no way I could use this 1:1 ratio. Xylitol and erythritol are the generic names. Swerve should work for the erythritol amount. Do you fave the powder or granulated? I'm not familiar with stevia in the raw. Does that have added ingredients? Do you like the swerve? You could try mixing the monk fruit powder into that. It would be the same ratio as above. 1/2 tsp monk fruit to 7 oz swerve. I've tried just about every sweetener out there and I prefer the blend of my 3 ingredients to all of them. The links are clickable to brands I've tried. Hi! I’m curious if you or anyone else has tried making a kind of simple syrup from this sweetener blend? I also usually store my regular simple syrups in the fridge, so I’m wondering how this might effect it, as well. I’m thinking it might be nice to have on hand for something like iced tea. This works for simple syrup but does crystallize in the fridge. It's better used fresh. 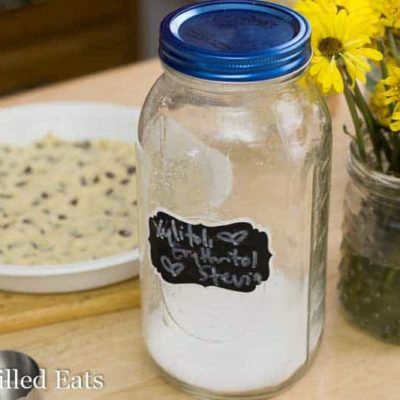 Do you have a DIY sweetener blend or store bought product that mimics Super Sweet? I tried to make your magic cookies using just erythritol and I can’t stand the “cold” taste. I had also tried brownies once with just xylitol and suffered the “potty sidedfects” that can occur. I really want to find a mix that works but I’m so afraid of xylitol now. Have you or had anyone else said anything about xylitol side effects from your mix? Thank you so much for your time and yummy recipes. I personally do not have tummy trouble with any sweeteners but I know some of my readers can tolerate a xylitol blend better than xylitol straight. Does your sweetener blend cause that "cooling" effect? Very slightly. Anything with erythritol does. It's much less pronounced than just using erythritol. Thank you for the recipe! If avoiding xylitol due to having dogs in the house... what measurements would you recommend for blending only stevia and erythritol? I prefer THM's Gentle Sweet over the Super Sweet. It would be the same as above with just erythritol. So 28 oz erythritol to 2 tsp stevia. Oh, awesome! And do you get powdered erythritol or granulated erythritol? Granulated. Much cheaper! I splurge and buy the powdered sometimes for icings. When I grind my own it's not quite as fine as the professionally ground. This is the result that I’ve gotten also. I was searching your comments for a note re: grittiness in icings using your sweetener blend. I’ve been using xylitol and Pyure for the erythritol/stevia and blending in a mini food processor. So, you have purchased powdered erythritol when making the sweetener for icings? Do you use the same xylitol and stevia? No, I just use the powdered erythritol for icing. If I'm just making a dessert for me I don't mind the slight grittiness of grinding my own sweetener. But for more special desserts the powdered erythritol works better in icing. If you are making one of your recipes that calls for your mixture do you follow the amount in your recipe or cut it in half? Follow the amount listed in the recipe. That is the correct amount for a sweetener that is twice as sweet as sugar. I was hoping for a bit more information in the nutritional info chart. Is one serving equal to a tablespoon? And what is the carb count? This sweetener blend sounds very good and I will probably give it a try. Thanks in advance! The carb count is 0. I manually subtract the sugar alcohol. The calories are basically 0 too unless you use a ton. I have it set for 1 teaspoon. I made this blend and need to understand more about it. I've put part of it in a coffee grinder and made a powder for using in icing or other recipes that call for a powdered sweetener and it seems to work fine. However, when I use it in the granulate form it does not sweeten the recipe like I would like. I do not like the cooling effects of erythritol and neither does my family. For instance if a recipe calls for 1/4 cup of erythritol how much of this blend should I use? I used 1 Tbl+1tsp (which is more than I thought the conversion would be) last night making blueberry muffins and they were not sweet at all. Hi Lynda, 1/4 cup erythritol is 4 tablespoons. You would have need 2 tablespoons of this blend. So you actually used a little less than you needed. There is no reason you can't use it powdered all the time if that is working better for you. I hope that helps! Yes, I like monk fruit blends too! It can be expensive though. Monk fruit measures 1:1 for sugar and is $8-10 a pound. My sweetener is twice a sweet as sugar so you use less and it is about $6 a pound. I am scared to death to use xylitol with having 2 inside dogs and unfortunately, I’m a messy cook😬😢. If not using xylitol what would be your recommendations for your baked goods if I omit the xylitol? 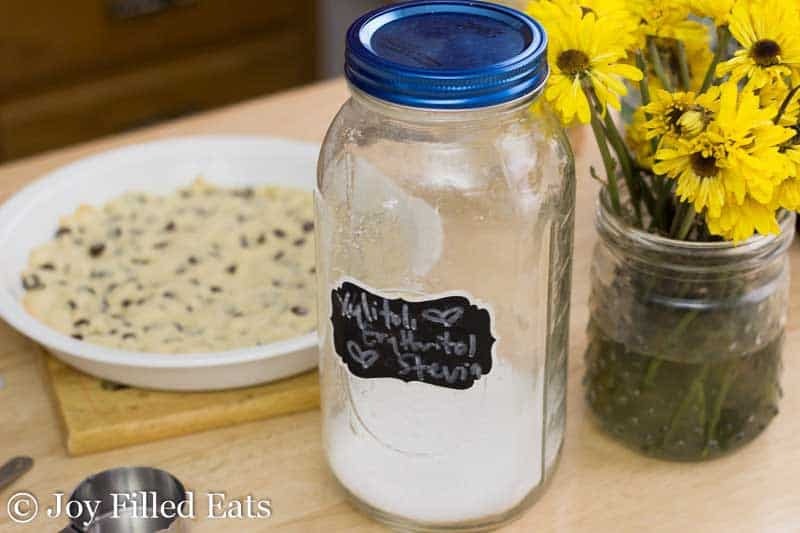 You can make this using all erythritol. How does it alter the taste? I also have dogs. The only problem is using all erythritol can give you that odd minty cooling sensation. How recently have you had people able to use the Thrive coupon? I clicked on the deal and entered my email. Put over $50 in my cart, but no discount. Checked my email, no coupon received if it's supposed to be that way. It does show on the initial screen the offer itself as being $20 off the first 3 orders over $49.99, but once I entered my email and added stuff to cart, at checkout nothing is discounted...I even took a screenshot of the page where it initially shows the $20 off coupon if that will help at some point, but no success I have been using your recipe for the sweetener 1:1 replacement since I first started low carb. It is a life saver and works without any aftertaste at all. Question: when you powder this mixture, does it ever get completely powdered? I have a little graininess in frosting because I don't get a completely powdered result. I've been using a coffee grinder. I've also used the bullet type attachment to my ninja blender. I have a cuisinart food processor but I've never tried powdering sweetener in it before. Does it really get powdered in your food processor? As far as I know my coupon has been working but I can check tomorrow. I'd try a different browser. If it still doesn't work you could call thrive. They have great customer service. My sweetener is always a little grainier than regular powdered sugar. I think it's just hard to replicate that with home appliances. I bet if you tried to grind cane sugar the same thing would happen. The Vitamix grinds it to a powdered state.